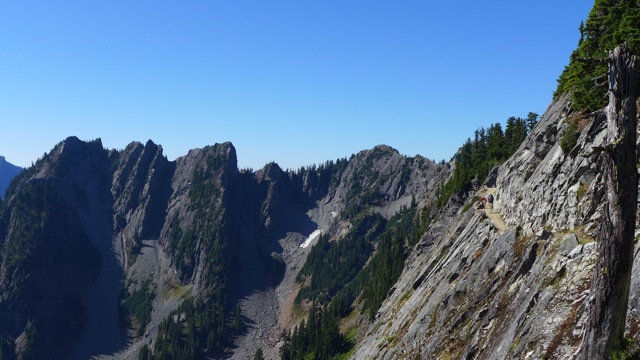 Ever since the book, and subsequent movie, Wild came out, a lot of attention has been paid to the Pacific Crest Trail (PCT) that runs from Mexico to Canada. Attention from trail runners, dayhikers and long distance backpackers, aka thru-hikers, who want to hike part or all of the trail made famous by the book about a woman getting her life back together. 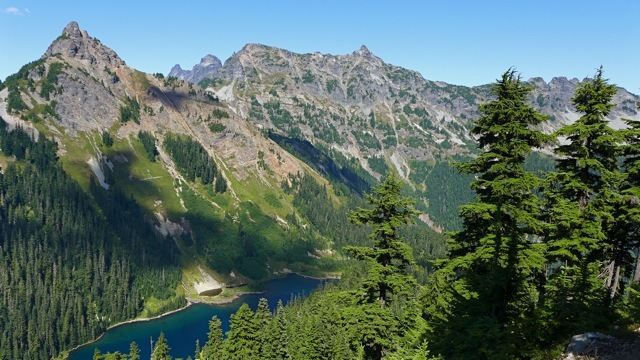 From this past weekend's backpack trip to Ridge and Gravel Lakes about 7 miles north of Snoqualmie Pass on the PCT, it appears that the trail may knock Snow Lake's trail off of its number one perch as most-hiked trail in the Alpine Lakes Wilderness (hmm, that word looks like "Wild Mess"). Our group of nine hikers arrived at the trailhead parking lot at 8:15AM to find a packed lot of cars with all manner of hikers preparing for the trail. As we made our way up the trail, there were people already coming down from the area known as the Katwalk, a section blasted out of the cliffs to provide a trail on a ledge. It was a hot day and we would have liked to linger in the shade a little more, but the leader pushed us to get to the lakes so that there would still be a place for us to camp. Since it was an overnight trip and we were all near-strangers to one another, everyone preferred to be in their own tent, making camp availability a little trickier (we needed to find 9 spots). 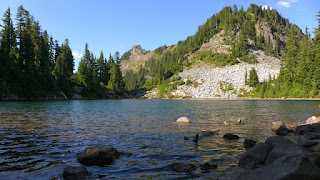 We pushed on through the lunch hour and arrived at Ridge and Gravel Lakes and found a meadow area at Ridge to spread out and camp. My first desire was to get under water, but the lake was so full of kids, people and a few dogs that it resembled a city park. Instead, I filtered water, set up camp and set out with the group a little later to hike further along the trail. 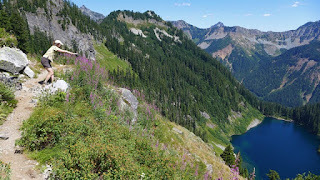 The views from this area of the trail just got better and better, from Mt Rainier and Mt Adams, to Alaska Lake below and the Gold Creek Valley stretching out before us, reaching to Kachess Lake. 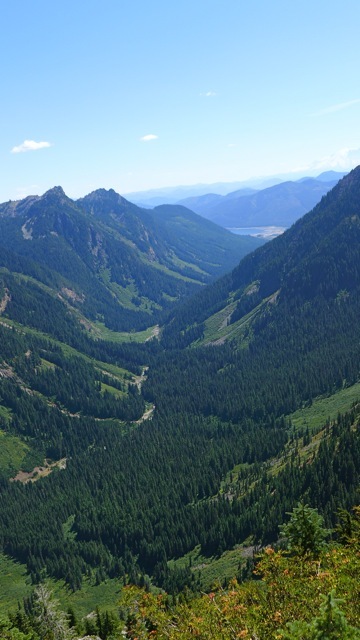 Alternatively, Gold Creek is a nearly desolate stretch of trail, where bears and other wildlife are almost guaranteed to be sighted. I made the hike via Gold Creek to Alaska Lake last summer and we saw only one other party. 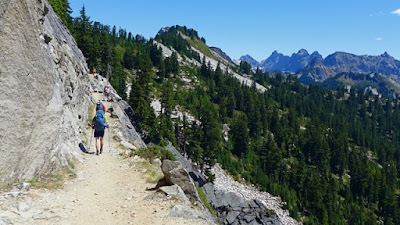 At our turn-around point on the PCT, about 2 miles further from camp, we rounded Alaska Mountain and could see Joe Lake down below and peaks to the east. In the heat, it was tempting to think about going down to Joe, but the thought of the rough trail and climb out kept me sitting on my hot, smooth rock in the shade. When we arrived back at our camp, the lake was quiet and I went for an early evening swim before dinner. Perfect! It was a relatively warm evening and we had a meadow to ourselves which led to some stretching and yoga. Soon, pigeons (a great glute stretch), dogs (hamstring, calves, shoulders) and even a few crows (ab strengthener, balancing and just plain fun) started to show up. The soft ground was very forgiving, a welcome contrast to the typical hard, dusty ground found in most camp areas. In retrospect, we probably should not have been camping in a meadow area, as it is more fragile. After a relatively quiet night (we heard nearby thru-hikers packing up at dawn), we woke and had breakfast. I started to pack up for our beat-the-heat early departure of 9am, then took a break to get into the lake one more time. The water was still, the area was quiet and the experience was perfect, sublime even. Pushing the water with my hands and feet, it was like being the very first animal to ever ply the water. The sun was up, but not yet searing and the morning was mine to savor. This was my Wild. Soon enough, we would be on the trail, seeing many hikers coming up the trail, trading places with them from the day before.